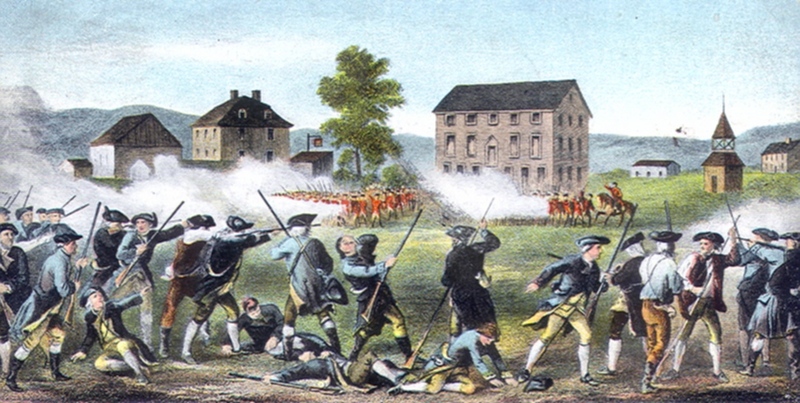 Lexington and Concord were the sites of the first battle in the American Revolutionary War, and the former is often highly romanticized by popular culture and literature. It’s portrayed as a grand battle when it was really no more than a skirmish. The first common misconception is that there was a minuteman company that appeared to fight the British as they passed through the town. What actually happened was that 80 militiamen met the British in a small guerilla skirmish. Most of these men were related in some way to their leader, Captain John Parker. Parker had heard Paul Revere’s famous warning and was wondering if it was true. At 4:30 that morning, a man named Thadeus Bowman confirmed its truth. Bowman was one of Parker’s scouts, and he said the British were not only approaching, they vastly outnumbered the colonists. Parker and the colonists had planned ahead. Most of the military supplies they’d been stockpiling was well hidden, and he saw no reason to order his men into battle without some kind of reason. No war had yet been declared, as the Declaration of Independence was still a year away. He’d also seen this kind of thing before, as the British were scouting the area for supplies they knew was held close by. Parker had tuberculosis, a fact that made him sometimes difficult to hear. So when the British came to Lexington and ordered his men to stand down, Parker was prepared to obey. His men did not hear his orders properly and the shot heard round the world was fired in the confusion.